What a pathetic attempt our council has made of celebrating the Queen's Diamond Jubilee.....a few plastic bunting in parts of the town.....not very good for a town so close to the Queen's Norfolk home. One shop stood out for me and that is Bonmarche,who have two lovely large pics of the Queen.As she is now in one window and in her coronation year in the other.On entering the store I was offered a book in which to write a message to Her Majesty. hi rainbow, couldnt agree with you more, very poor show from our council, think you should get a petition up to get the council to put more jubilee flags up, then they will listen! Rainbow, it's much the same down here. I'm in North Suffolk and have also been in South Norfolk today. Nothing! Maybe here and there a house decked out with a few tatty pieces of bunting left over from the Silver Jubilee. We've got a discrete amount of bunting on the house and the wife has a couple of flags on the car. Nothing else in our village and nothing going on. Now, we're not great royalists as they go, but the prospect of a president such as the prime ministers we've had this last thirty years leaves me cold. Better 'towled queen, as they say in Yorkshire. Just back from North Yorkshire and just about every village there has approx 25% of houses with bunting and/or flags. Some, usually the smaller ones, have just about every building covered. It looks great, very festive but on the drive home as we came further south so the bunting dried up. Most villages seem to have at least 2 events over the weekend and Snainton where we stopped according to one local has a "whole weekend of jollifications planned". Maybe the sense of community is better up there. Not surprised really... just about reflects the type of town we are and moreover the type of low calibre people running things. I live in Lynn but work in London, staying in Dorking, Surrey four nights a week. 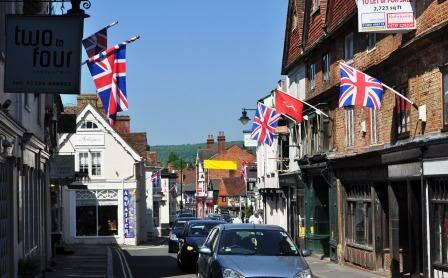 If you want to see patriotic bunting, go to Dorking. The place is awash with red, white and blue, with Union flags flying from most buildings, both commercial and residential. I think you'll find that the flags in Dorking have absolutely nothing to do with the jubilee - the Olympic road race went through on Saturday. Note the Manx flag in the middle. Pity Cavendish didn't manage it though but fantastic silver by Lizzie Armitstead on Sunday - well worth flying the flag for! Twowheels wrote: I think you'll find that the flags in Dorking have absolutely nothing to do with the jubilee - the Olympic road race went through on Saturday. Note the Manx flag in the middle. Pity Cavendish didn't manage it though but fantastic silver by Lizzie Armitstead on Sunday - well worth flying the flag for! I think you'll find the flags and bunting displayed this summer in Dorking had everything to do with the Diamond Jubilee. Dorking had red, white and blue bunting and decorations and Union Flags up all around the town earlier this year long before the Olympic cycle race rode up the town's main street. The town openly celebrated the Queen's Diamond Jubliee and the flags and bunting remained in place in the intervening period until the start of the Olympics. Attached is a picture of Cummins' hardware shop who re-decorated their shop front in exactly the same way as it was decorated for the Queen's Coronation in 1952. It is just one example of lots of shops, businesses and private premises showing their support during a patriotic British summer. Yet, this was something I can safely say, did not happen in quite the same way in King's Lynn.